Two days after plans were announced to construct a new home for the Islanders, the team ensured that a major building block for its future will be on the ice when the new arena is christened. Michael Grabner, the team’s leading goal-scorer this past season, committed to the Isles for five more years, guaranteeing he’ll be around for that shiny new rink’s opening in 2015-16. The signing makes Grabner the second top scorer on the Islanders in the last four months to opt for a long-term deal to stay on Long Island rather than becoming an unrestricted free agent. Matt Moulson, who ranked second on the Isles in goals with his second straight 30-goal season, signed a three-year deal at the end of January. 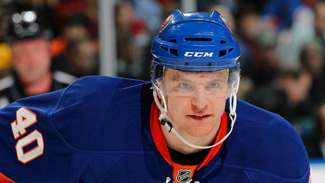 Rookie forward Michael Grabner is proud to make a commitment to Long Island. Highlight video. That winning is a special feeling with any team, but after Vancouver and Florida passed on the Austrian winger prior to last season, trading and waiving him, respectively, winning with the Isles would mean that much more to Grabner. For Isles fans, the contract means five more years of blazing speed, highlight-reel goals and classic tweeting. Add to that a brand new, state-of-the-art arena and something extraordinary is coming together on Long Island. It’s only the middle of May, but with a long-term deal for a rising superstar and the declaration of a new arena, this off-season is shaping up to be one of the most memorable in Islanders history.